Assassin’s Creed Odyssey surely is one of the year’s most eagerly anticipated games, taking players to ancient Greece in order to face mythological creatures and other enemies, while Ubisoft also claims this will be much longer than last year’s entry Assassin’s Creed Origins. And French video game company Ubisoft recently revealed its post-launch plans for the game, which include a massive season pass featuring more content than you can shake a stick at. Actually, this not only features two major expansions (as was the case with Assassin’s Creed Origins last year), but also includes a remastered edition of 2012’s colonial era game Assassin’s Creed III. The first expansion for the game, Legacy of the First Blade, involves Alexios or Kassandra (the game’s protagonists) encounter with the first character to use the iconic hidden blade, offering more backstory on the enigmatic Assassin order. The second expansion, though, could be even more interesting. Titled “The Fate of Atlantis”, this is set in the legendary city of Atlantis as its title indicates, and like Assassin’s Creed Origins’ Curse of the Pharaohs expansion, has you taking on godly creatures, this time in the fabled city of legend. What’s interesting about these expansions is that they won’t be released in one chunk as was the case with Assassin’s Creed Origins, but rather in episodic format, each episode roughly six weeks apart according to Ubisoft. Legacy of the First Blade will begin releasing in December, while The Fate of Atlantis kicks off in Spring 2019. Aside from the extra story content, those who get hold of Assassin’s Creed Odyssey’s season pass will also be able to play Assassin’s Creed III Remastered. This game (which came out in 2012) is set during the American Revolution, and while it doesn’t feature the series’ most charismatic protagonist to date, is one of the few games to bring colonial America to life. Also set during colonial America is Assassin’s Creed Liberation, a remaster of which is also included as part of Assassin’s Creed Odyssey’s season pass. This 2012 PS Vita release is renowned for being the first Assassin’s Creed game to feature a female protagonist. Both of these remasters feature 4K resolution support and other enhancements, and will be available in March 2019. This season pass retails for $40 US dollars, but both story expansions and also the Assassin’s Creed III Remaster will also be available to purchase standalone for those who don’t wish to take the plunge and buy into all this content now. The season pass also forms part of the collector’s edition of the game, and others (see here for more info about this). Those who only decide to buy the base game won’t be left out in the cold either, as Ubisoft will be offering extra content for free to Odyssey players too. This comes in the form of The Lost Tales of Greece, a series of extra adventures set in ancient Greece. This will be released at regular intervals in between the season pass’ episodes. Plus, new in-game battles will become available as new epic mercenaries and ships will appear in the game regularly, ready for you to defeat. 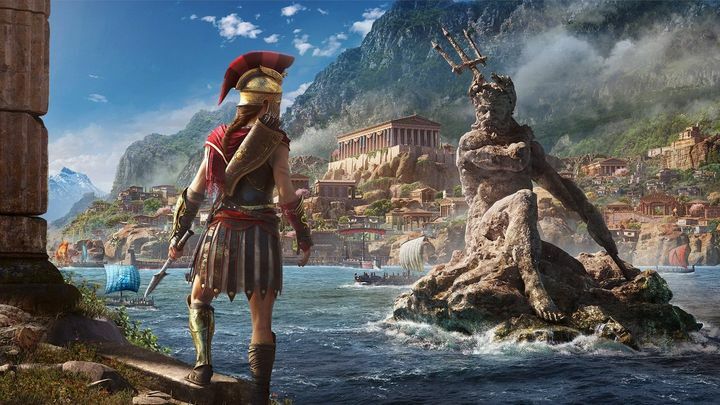 And as was the case with Assassin’s Creed Origins, Assassin’s Creed Odyssey will also get a Discovery Tour, letting you explore ancient Greece at your own pace without those pesky enemies bothering you at every turn. This will allow players to learn about the various landmarks and the history behind them as they go along. Ubisoft definitely has a ton of content planned for the game, although how good all of this will be is something that remains to be seen. If this can in any way match last year’s stupendous Assassin’s Creed Origins and its expansions though, then players are surely in for a treat when Assassin’s Creed Odyssey hits shelves next month. Note: Assassin’s Creed Odyssey will be released on October 5, 2018. Available on PS4, Xbox One and PC.